"Our health is only as good as our immune system"
Is aging a chronic disease process? Does that disease process have a common cause? If so, is there a common remedy? Adult stem cells repair injured and diseased tissues and constantly replace worn-out normal tissues. However, as we age, there is a chronic decline in self-repair, starting from when we are quite young. In other words, aging is the result of a steady progressive decline in stem cell function. There is broad consensus that there exists a wide range of diseases associated with aging, particularly cancer, degenerative, auto-immune, neurological and cognitive diseases. The corollary question, therefore, is this, "Is there a common thread to all these age-related diseases?" We are aware that one of the common threads of aging is inflammation which seems to be at the root of many of the afflictions as we age. Inflammation rears its ugly head in many different fashions by affecting many different pathways in the body. These pathways control the fate of certain genes which can either be turned on or off, depending on the stimulus. These same genes can control our destiny. They can encourage many diseases or can prevent many diseases. If we look more closely at aging we see certain trends leading to the point where Dr. Ron Dipinho, from Harvard University, has proposed the unified theory of aging. He believes that telomere damage is a major culprit and common cause of aging. Telomeres can be simply described as tails attached to cells that represent one's DNA. We know that telomere length steadily shortens every time the cells divide, until they eventually become no longer viable and the cells die. This gives rise to two issues. One is death itself. The other is declining quality of life the shorter the telomeres become. Short telomeres ultimately affect the mitochondria causing them to lose effectiveness and cause the “death spiral of the cell”. The mitochondria produce free radicals which wreak havoc on the body on many different levels. Consider them like terrorists in the body unleashing damage on multiple levels. The cell is programmed such that, when its telomeres reach a certain critical level, the P-53 gene becomes active and it leads to cell death. If the P-53 gene does not eliminate the aged cell, many bad things begin to happen. A method of helping the P-53 gene is to use senolytic agents in the body. These are compounds which essentially kill senescent cells, cells that should have died but instead remain alive and secrete many inflammatory growth factors. There is a great deal of ongoing research into the question of how to turn on the P-53 gene. At one time is was thought that too much P-53 is just as bad as too little. But the good news is that the body has some safeguards so that excess p-53 does not seem to be a problem since the body will slow down the system. It is felt that the senescent cells are a major contributor to aging since they secrete many inflammatory growth factors which wreak havoc on many different levels. Typically, our health is only as good as our immune system. This is a very profound concept. We know that, as telomere length shortens, our immune system declines. Plainly, if we could stem the decline in telomere length, we could not only extend our lives but live more healthily in the process. Clinical studies done in 2016 utilizing certain autologous V-cells have been able, not only to preserve but to increase telomere length for at least six months following treatment. On older mice, their hair went from patchy grey to black and skin elasticity increased, amongst myriad other measurements taken where results were correlated with telomere length of peripheral blood leukocytes, white blood cells that form a very important part of the body's immune system. V-cells seem to turn on telomerase in other cells. Telomerase is an enzyme that can restore the ends of the DNA, thereby enabling these cells to go back in age. Many will remember Dolly, the first cloned sheep. Few will know that Dolly died of old age at a young age. That is because the telomere length of her cells started out with the reduced length of the cells that were cloned. If the cloned animal were to be further cloned, then that life expectancy will be shorter still. The only cells that retain telomere length throughout our lives are reproductive cells which is why naturally conceived babies are born with full-length telomeres regardless of the age of their parents. There are very few if any medications, supplements, or treatments that can actually lengthen telomeres. The very best may slow down telomere shortening by perhaps 16% but not reverse it. By contrast, V-cell procedures have been shown to reverse it!! 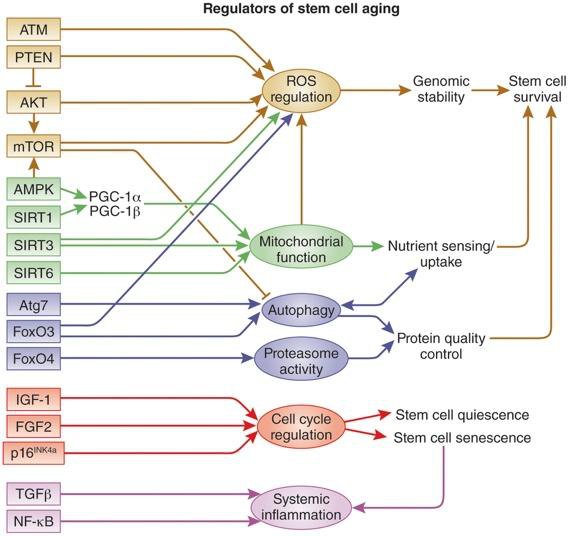 The following diagram represents the essence of aging, showing the stem cell aging pathways. How stem cells age, determines how the body ages. Unlike many anti-aging facilities, we are directly addressing these pathways. Taking anti-aging to the next level is our advanced cellular repair division. In our clinic, we do not use hormones etc. to try to slow down the clock of aging. Certainly, hormone therapy has its place, but we feel that this type of treatment is unlikely to be a game changer in respect of life extension. Hence, we leave such treatments to other clinics [and, of course, are happy to work with them]. For our part, we are attacking aging on a cellular-molecular biology basis. When we stimulate these pathways in the proper manner, their effects can be profound. Let us take a closer look at some of these pathways and examine how we are addressing them. The first pathway to address is the sirt 1,3, and 6. This represents the sirtuin genes. These are generally regarded as one of the most important anti-aging pathways. These genes have a dramatic influence on the mitochondria and their health. The mitochondria produce ATP which is the fuel upon which most cell function relies. The healthier the mitochondria are, the healthier we are. As is the usual story, as we age the number and function of the mitochondria diminishes. The sirtuin genes are influenced by a number of factors. One factor that turns them on is starvation. Starvation is scientifically proven to slow down the clock of aging. Another commonly known factor that influences the sirtuin genes is resveratrol which comes from red wine. A better alternative to resveratrol is pterostilbene. Multiple studies have demonstrated that both resveratrol and pterostilbene have preventative and therapeutic benefits on the mitochondria. However, we are now aware of a much more important compound that has monumental influence on the sirtuin gene family. This compound is called NAD. NAD stands for nicotinamide adeine dinucleotide. Actually, the supplement that is taken is called nicotinamide riboside. This gets converted to NAD. Earlier in 2018 there was an article in time magazine touting the importance of NAD as a source of anti-aging. It is extremely important to take NAD on a daily basis. However, as we age we can ingest NAD supplements, but we have difficulty delivering NAD to the cell. The reason for this is that as we age we lack a certain enzyme which dramatically facilitates the delivery of NAD to the cell. This problem can be overcome through our advanced cellular repair division. One of the scientists affiliated with our clinic, Dr. J Serrintino, has developed an enzyme which will increase delivery of the NAD to the cells. We have investigated this further and found that on its own, nicotinamide riboside (NR) does not promote longevity or cell health. In most organisms it is the kinase precursors (nicotinamide riboside kinase 1 & 2 NRK) that signal conversion of supplemental NR to NAD. We now have the kinase enzyme which we will deliver via a patch. This will allow dramatically increased amounts of NAD delivered to the cells. This is revolutionary and is one of the backbones of our anti-aging protocols. Indeed, it forms a central component of our advanced cellular repair division. There are no other facilities in the world that have this technology other than Dr. Purita’s other clinic located in Boca Raton, Florida. Please read the blog on NAD which will further elucidate this subject. Another aspect subject to scrutiny by our advanced cellular repair division concerns a gene called p-53. In a nutshell the p-53 gene is responsible for flagging down what are called senescent cells and causing them to die. A senescent cell is one which should have died but it continues to survive. Unfortunately, its continued survival causes havoc in the body since it secretes many inflammatory growth factors that cause a variety of problems including cancer, diabetes, and a host of diseases of aging. We now have a patch available to deliver p-53 to the body which will flag and kill these senescent cells while at the same time making other cells healthier by repairing their DNA. Again, this treatment is only available in Dr. Purita's two clinics. For further information please read the blog on p-53. As time goes on, with the guidance of Dr. Serrintino, we will be attacking the rest of the aging pathways. This will be accomplished by a combination of supplements, enzymes, and growth factors. Amongst other applications, we shall utilize these techniques on a local basis to enhance our stem cell procedures, including the treatment of joints. There is no substitute for exercise and a healthy diet, so keep on doing that. Get periodic V-Cell treatments [periodic infusions of autologous V-cells plus growth factors and cytokines]. Recommended periodicity may vary, depending on one's age and other factors. More details on V-cell treatments are set out on the V-Cell page. For an abstract of clinical trials on telomere lengthening, please contact us.